Louisville, Kentucky, has a lot of options for tourists. 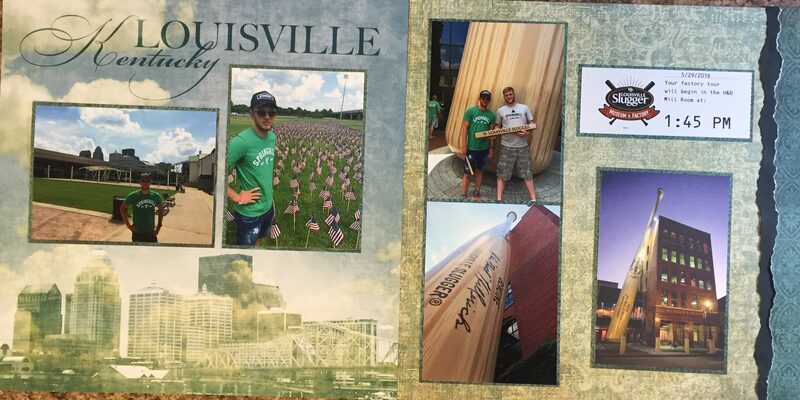 One of the stops that I think that everyone must make is the Louisville Slugger baseball bat factory. This was our second visit to the factory and museum (See 2013 visit). The factory still operates in this location, but they have an amazing museum and factory tour that is great for all ages. Visitor Tip: When you get to the location go and get your factory tour tickets first as they will be set for a certain time – then go and look at the other parts of the experience. This way you won’t waste time waiting for your tour after you have seen everything else. For this spread I used some pre-designed Louisville, KY paper that I purchased at the factory store. I focused on the river front on the left hand page (which we actually did after the factory visit), and highlighted the factory visit on the left hand page. I did this because I did not have enough pictures for 4 pages to do two double spreads – but I didn’t want to leave anything off and only do 2 pages. The right hand side includes the ticket to the factory to serve as a date and time stamp for the page. i used a jagged edge tearing tool to create the double border on the right hand side of the spread. For this second spread I used two different baseball themed background papers, and bordered the photographs in green to match the color of the grass. I also included a sticker bought at the factory store. On the right hand page I used two of the same brochures and mounted them so that each one showed one of the sides of the brochure. I did not put a border on these as I wanted as much of the background paper (baseball stadium) to show through.